This is a fascinating book with more than 150 entries. 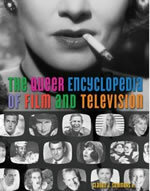 Although most are about individuals, including Dorothy Arzner, Raymond Burr, Margaret Cho, Marlene Dietrich, Sir Ian McKellen, Rosie O’Donnell, RuPaul, and Andy Warhol, many others cover such wide-ranging subjects as American television, Canadian television, Documentary film, Film noir, Film sissies, Pornographic film and video, and Stereotypes. Many of the entries make fascinating reading. Boomers, for example, will remember Tommy Kirk as a child actor in many Disney productions. Two-thirds of the way through a four-page entry entitled Film actors: Gay male can be found reference to the courage displayed by Kirk when, as a teenager, he came out to Disney and was immediately fired. His bravery is a moment in gay history that deserves to be remembered. Certainly his story will continue to have special meaning to contemporary young people as they find themselves struggling with their own experiences, feelings, and fears. And in the entry In the Life, readers will discover that this gay and lesbian broadcast news magazine, which debuted in 1992, was denounced on the Senate floor by Robert Dole before it ever aired and that many pubic television stations are still reluctant to broadcast it, in spite of the fact that it is watched by more than one million viewers.